Heh that's pretty cool. What's with the weird pattern on the top that occurs when you fill each line up with blocks? Seems weird that each column would have a random max number of blocks. It's supposed to max out at 10, but I just realized I'm not really accounting for the blocks that are already falling when doing the check if it's ok to add another block -- heh, should I fix it or leave it as is? Leave it as it is. It's like looking at tea-leaves. I was trying to see secret messages in it. 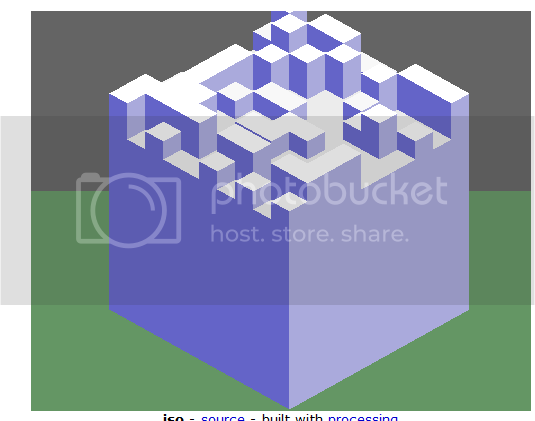 If someone wants a perfect 10x10x10 cube, well, they're going to have to work for it.